In this third edition, 8 architectural video projectors are split into 630 sub-projectors using an apparatus of concave mirrors designed by artificial nature. Each mirror and its backing structure are computationally generated to create a group that collaborates to form the single image in the air. By measuring the path of each of the 16,000,000 pixel beams individually, light beams can be calibrated to merge in the haze to draw in the air. 40 channels of audio are then used to build a field of sound which solidifies the projected phenomena in the audience’s senses. 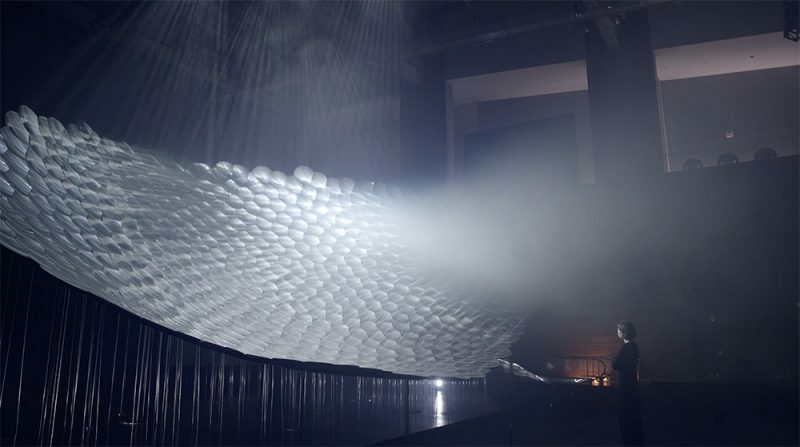 A more compact version of Light Barrier was first exhibited in 2014 at the New Media Night Festival, Nikola-Lenivets in Russia. The much larger version of the piece seen here was shown last year in collaboration with the Asia Culture Centre. You can explore many more of Kimchi and Chip’s experiments with light on their website. UPDATE: Creative Applications just published a great article on Light Barrier.